The sequel to this game, Hornochsen, is also available from Fair Play Games. Great filler, and a good game for time spent with non-gamers. A game that executes really fast as you only have 10 turns to place your cards. It's really a game of risk taking, calculated moves with a bit of "luck should be on my side". Good for fun and a social game as it allows up to 10 players :-). It has a compact package so you can "just bring it along" to that friend and family gathering. I have been playing this game with casual gamers for years, and it is a great filler. You have a constant feeling of almost being able to control when you have to take cards (negative points), but not quite after all. Every game group needs that game that you play for the 10-15 minutes while people are showing up before the "big event" games. This game definitely fits the bill. It's pleasant, easy to play, and allows you the brain power to carry on conversations while you play. If you need a starter/filler game but this one doesn't quite grab you, definitely try out No Thanks or For Sale! 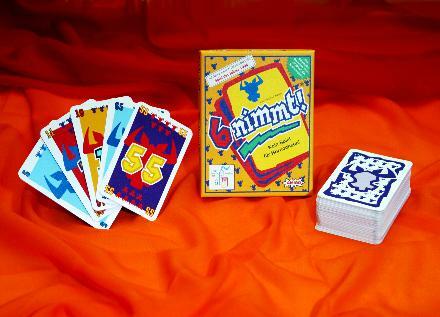 This is a real cool card game (numbers based) and is fun for the whole family (5th grade and up?). We've played this numerous times at our family reunions, and the kids & young people want to play it every time we get together. It's catchy. I'm not sure how much strategy there really it, but it is a lot of fun. Game is in German language. English version is called "Category 5" and that is fun too....done with a Hurricane theme.